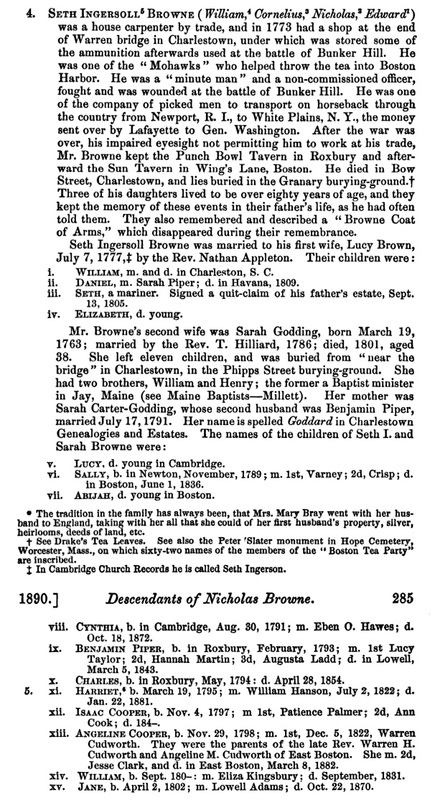 "New Hampshire, Marriage Records, 1637-1947," index and images, FamilySearch (https://familysearch.org/pal:/MM9.1.1/FLFG-RQP : accessed 23 Nov 2012), David G. Skillings and Julia O. Glode and null, 1888. Biographical sketches of representative citizens of the commonwealth of Massachusetts, , at https://books.google.com/books?id=pvIMAQAAMAAJ . Boston: Graves & Steinbarger, (1901) , p. 703. Anna Glover, Glover Memorials and Genealogies: An Account of John Glover of Dorchester, and His Descendants., , at https://books.google.com/books?id=ygeSH-4i9VAC . 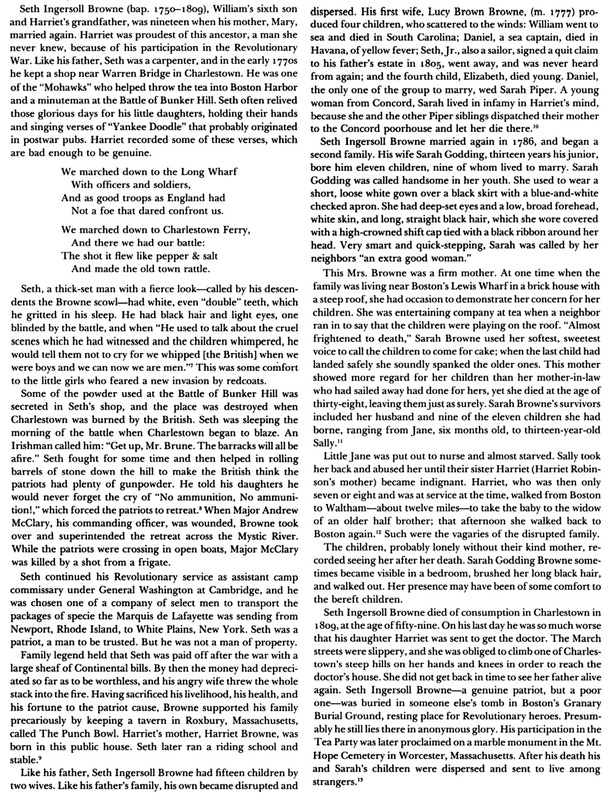 Boston: David Clapp & Son, (1867) , p. 210. 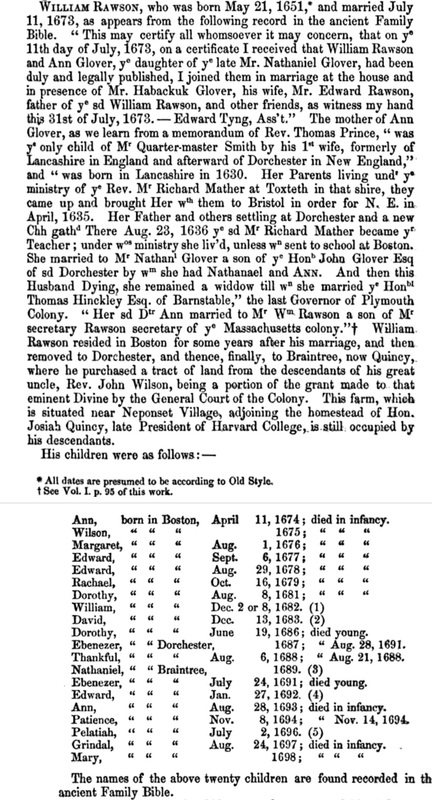 "Notices of Descendants of Secretary Rawson", The New England Historical & Genealogical Register, Vol. 3, , at https://books.google.com/books?id=UATv4fSk6xkC . 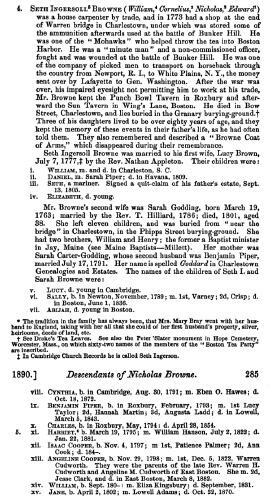 Boston: New England Historic Genealogical Society, (1849) , pp. 299-300. Anna Glover, Glover Memorials and Genealogies: An Account of John Glover of Dorchester, and His Descendants., , at https://books.google.com/books?id=ygeSH-4i9VAC . 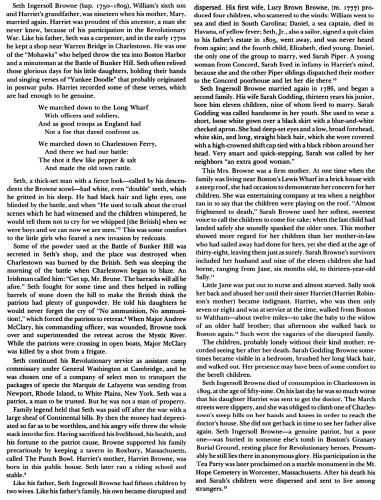 Boston: David Clapp & Son, (1867) , p. 394. 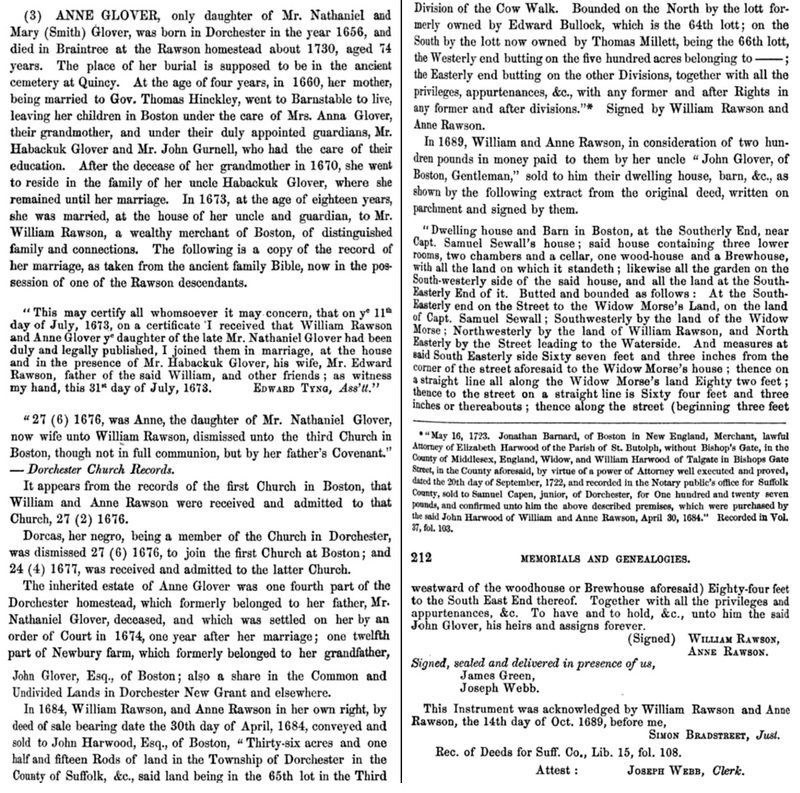 "Massachusetts, Town Clerk, Vital and Town Records, 1626-2001," database with images, FamilySearch (https://familysearch.org/ark:/61903/1:1:F4LG-LJY : 13 July 2016), John Goddard, 04 Oct 1698; citing Birth, Roxbury, Suffolk, Massachusetts, United States, , town clerk offices, Massachusetts; FHL microfilm 741,320. 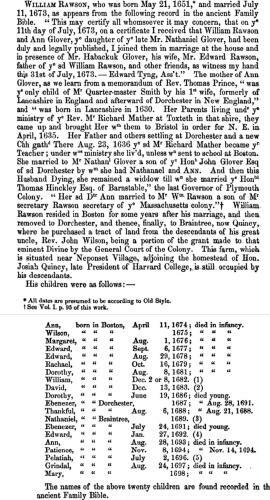 William Richard Cutter, New England Families, Genealogical and Memorial: A Record of the Achievements of Her People in the Making of Commonwealths and the Founding of a Nation, Vol. 3, , at https://books.google.com/books?id=NdAUAAAAYAAJ . Lewis historical publishing company, (1914) , p. 1535. 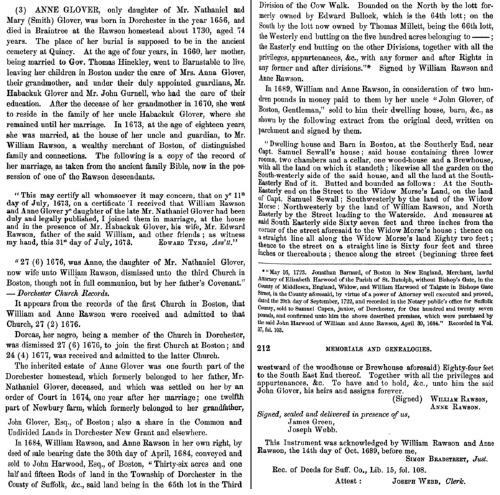 William Richard Cutter, New England Families, Genealogical and Memorial: A Record of the Achievements of Her People in the Making of Commonwealths and the Founding of a Nation, Lewis historical publishing company, (1914) , Vol. 3, p. 1535.